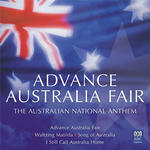 Advance Australia fair : the Australian national anthem. Carl Linger emigrated to South Australia from Germany in 1849. In 1859 his work Song of Australia won the Gawler Institute's National Song Competition against 80 competitors and in 1880 the state government of the colony of South Australia instructed that the piece be sung in all state schools. In 1977 Song of Australia was one of four songs included in a national plebiscite to choose Australia's national anthem.